Today’s post is for Project 52, a weekly blog project that I am working on with several other talented photographers whom I’ve come to know and adore over the past year. In this project, we concentrate on light and spend several weeks exploring an overarching theme. We are currently playing with light in black and white, concentrating on taking an image that we intend to convert to black and white even before we’ve hit the shutter button. 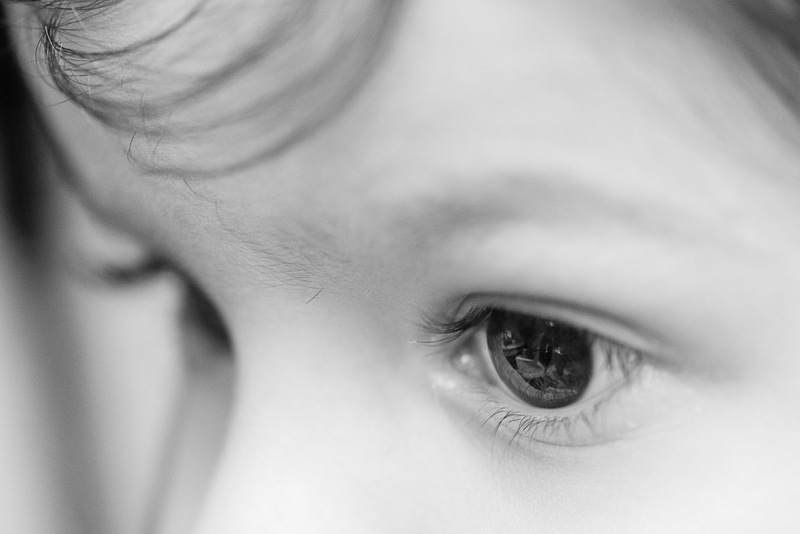 In today’s B&W image, I was relying on black and white less for it’s ability to bring out subtle shadowing in a portrait, and more because a monotone can reduce distraction from my subject – the world reflected in my daughter’s eye. Our recent travels have meant that a series of loved ones have surrounded her, and then quickly left her again – quite a lot for a three year old girl to handle. She has loved running around with her best friend James today, but has come to check in with me a couple times, including at this moment. I hope that I provide a constant for her in the madness of our travel. Please continue along our creative blog circle to see what my lovely friend Kim DuPree has posted. It is sure to be stunning! Click HERE to see Kim’s final play on light in black and white. I love your story behind this image! That reflection is outstanding and your words are beautiful. Gorgeous capture, Kami!